In a move that strikes a balance between becoming more consistent with the mobile apps and giving desktop users the best experience possible, Google has made some tweaks to Play Music's playlist interface. 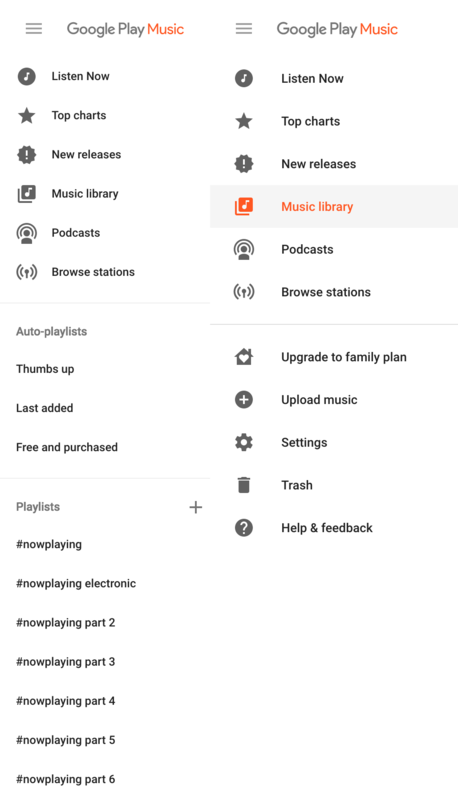 While playlists are no longer on the top level of the left-side hamburger menu—to be more like the phone and tablet UI—web users can use a shortcut to access a new sliding menu from the right. Previously, playlists were jammed into the main hamburger menu on the left side. This wasn't necessarily bad in and of itself, but if you are switching between the web and mobile interfaces, it can be jarring that everything is the same except the presence of playlists in that menu. It's less busy without the playlists, but again that probably wasn't the main motivation. From there, the new sliding menu shouldn't feel too unfamiliar. If you were used to the old setup, you might double take a few times before getting the hang of it. Those who spend most of their time on mobile as well as new users, though, should find this more intuitive.